Virus Cleaner is powered by McAfee - the powerful anti virus engine in the world - protecting your phone from any of extortion virus, malware, Trojans. We have official partnership with McAfee that is a part of Intel Security, so Hi Security is able to offer the world-class antivirus protection service globally. Scheduled Virus Scan Automatically scan your phone daily, weekly or monthly. Deep Scan - Scanning and Examining FilesScanning both internal device storage and SD cards. Remove viruses and threats from your mobile phone. Memory Junk Clean - Memory CleanScan and clean phone memory junk. Optimize phone speed by releasing more phone memories. Safe Browsing - A Real-Time Online ProtectionBlock malicious URLs and protect yourself against phishing websites with instant warning notifications. App Lock - Smart App Lock with Stylish lock ThemesWith it, you can add an extra password protection to sensitive apps. This Applock's password is different from your phone unlock password, therefore you can safely lend out your phone. Lock your private apps by using fingerprint, pattern or PIN and keep your secret safe from snoopers. Personalize your unlocking App lock themes and make unlocking experience unique and interesting. Brand new App Lock's themes updated. Fingerprint unlocking is technologically supported specific devices and Android 6.0. Efficient WiFi Speed Test and Security Virus Cleaner protects your online security. Test speed, detect WiFi spy and protect your WiFi. No more worries about your WiFi safety concerns. User Friendly, Super-Fast, Energy-Efficient and Tiny Virus Cleaner only takes less than 10 sec to examine your entire phone with one tap. Battery-saving and less memory consumption. Tiny size with decent security functions. 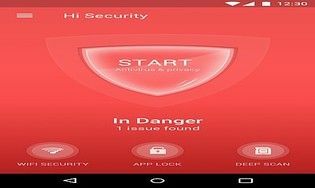 L’éditeur antivirus espagnol s’offre aussi une application Android. Le géant de la sécurité Eset propose aussi une solution pour mobiles.